The Bank workers of India are going on a one day strike at an all India level on 22 August ‘17, this collective action comes at a crucial juncture of India’s political, economic and social life. In fact this is the second time (the first one was February ‘17) since Demonetisation that the Bank workers have declared their defiance against economic policies of NDA/BJP regime led by Modi. 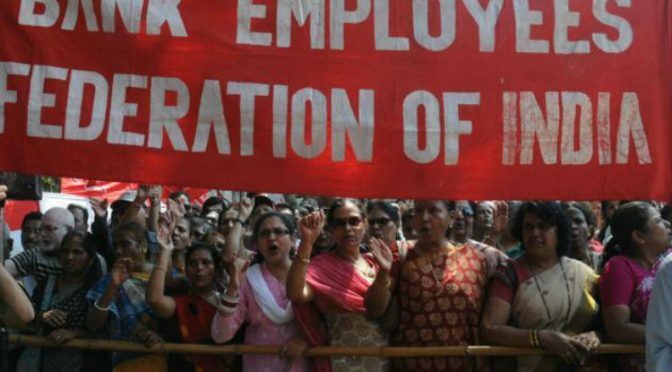 The New Socialist Alternative (CWI-India)​ considers this decision to go on strike by the Bank Workers Unions as a very important development in the light of the economic hardship that working people of this country are facing after the two policy disasters of #Demonetisation and #GST imposed on the people by the #Modi‘s regime. While the Bank workers belonging to 9 different unions coming from all categories from workers to officers, who have come under the banner of United Forum of Bank Unions (UFBU) have unitedly declared this industrial action, with a 17 points of demands, majority of which concentrates on the policies that affect the entire population of this country. The policy fiasco of Demonetisation and the imposition of GST, has not only fatally affected the life of the poor in this country, throwing tens of thousands out of their jobs, in fact more than 100 people died during the weeks of chaos of Demonetisation, including around 13 bank workers died due to unprecedented stress and pressure of work. In the light of a paradoxical situation, where in this so called “parliamentary democracy” the entire opposition suffers a political paralysis, the very task of repelling the increasing authoritarianism of #BJP government falls on the shoulders of the organised battalions of the working population. Very importantly amongst the 17 point list of demands the bank workers under the banner of UFBU have demanded the reversal of Privatisation as the first priority. The entire working class people have been burdened by this neo-liberal economic disaster across the spectrum of all public sector industries and services. This disaster of Privatisation descended on the people of India along with 1991 neo-liberal reforms which is essentially anti people and pro rich. While Public Sector is weakened, neglected and destroyed chunk by chunk, block by block, lakhs of workers are loosing jobs and are forced into modern slave labour in the informal and private sector, where wages are whimsical and working conditions are appalling. It is in this context that the Bank Workers All India Strike is crucially important, the general working class population needs to wholeheartedly support this industrial action without any reservations. Since the advent of Modi regime, which is increasingly becoming vicious day by day, there is an enormous discontent building up amongst the ordinary people against the Modi’s communal, casteist and disastrous economic policies. Bank unions need to reach out to these sections including small traders, self-employed professionals, and the people at large to make the August 22, ‘17 strike an effective one, paving the way for an all out General Strike (in the very near future) against the Modi’s crony Capitalist regime, which is further enriching the life of Millionaires, but destructively ruining the lives of the ordinary Millions. Support the Bank Workers in their fight against detrimental Economic Policies of the Government. Say no to Privatisation of Banks. Re-nationalise all privatised Industries and Services under workers’ control and management. NPAs: Sequester the properties of the Rich. Those businessmen/women who have robbed the peoples resources are CRIMINALS, Start the criminal proceedings against all NPA criminals. Oppose and defeat the proposed labour reforms of BJP government. 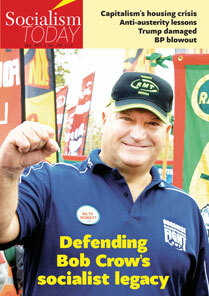 Oppose outsourcing of permanent jobs and casualisation. We Demand decent liveable minimum wages of Rs. 25,000 per month for all. We demand jobs for all. Compensate all those who lost lives and health due to demonetisation fiasco, make the BJP government pay. Defeat this authoritarian, communal, casteist and pro-rich government of the BJP. Previous PostChina: State repression and the prospects for workers’ struggleNext PostModern Rasputins!